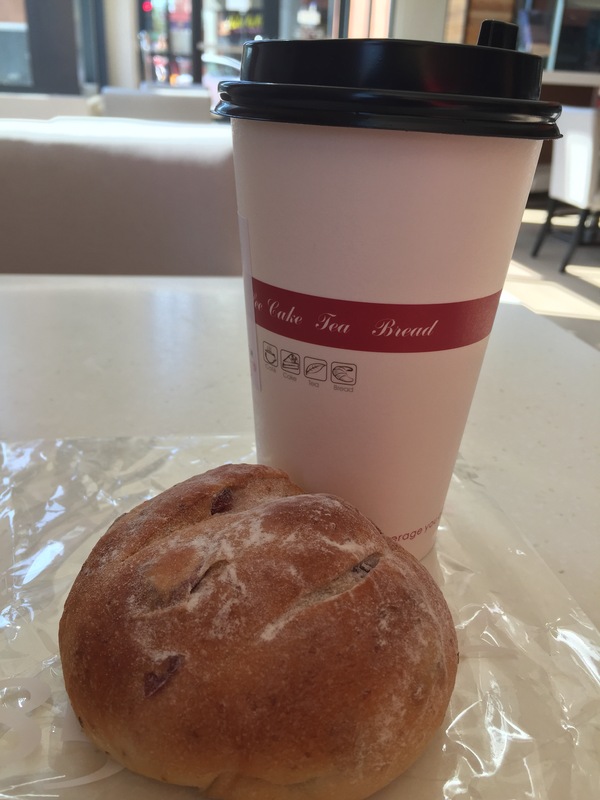 I fought the urge to go to Urth Caffe this morning and settled on a more appropriate 85 Degree Bakery in Old Town Pasadena, and enjoyed a cup of coffee with a small cranberry and cream cheese bread for breakfast today. I saved about $20 compared to the mea culpa breakfast I had the other day. And that’s with additional goodies I picked up for my husband and my daughter! I know this is hardly newsworthy but I just had to share my excitement with the world, or the 7 kind people that actually read my blog! From the way I’ve been blogging about bread lately, you might think I spend every day in the kitchen kneading up these carb-y lovelies. I wish that were the case but unfortunately it’s not. It’s been a crazy hot, and uncomfortably humid, summer and the last thing I want is to convert my apartment into a sauna. 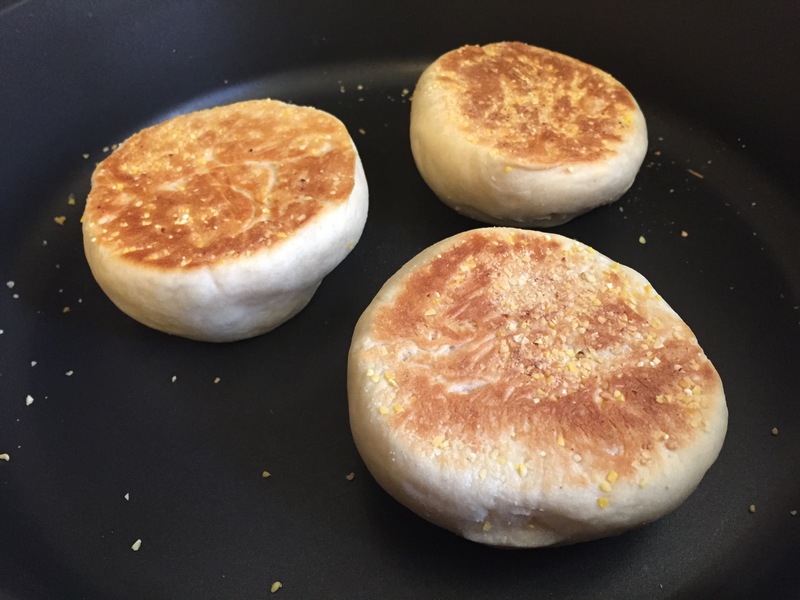 I did make English Muffins recently but that was because the recipe didn’t require me to keep the oven on for hours (they cook on a griddle!) and I was in the mood for some homemade breakfast sandwich with fried eggs or toasted ones smothered in Bonne Maman strawberry jam. 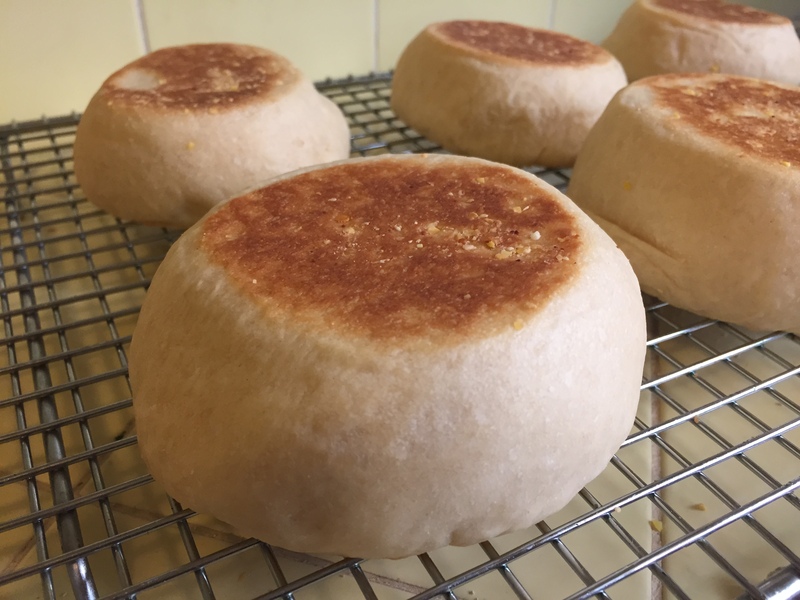 The English Muffins was the third creation from Peter Reinhart’s The Bread Baker’s Apprentice (first was Baguette, and the second was Focaccia). I’m not sure if I should call this book a cookbook or a text book but either way, it’s excellent with detailed instruction and explanation. During my Konmari decluttering phase, I got rid of almost all the cookbooks I owned, but, of course, this one stayed. It was no brainer. I truly think this is the best bread-making book ever written. I think one of the most valuable tips I got from my recent bread-making adventure at Surfas Culinary District was mise en place, or “putting in place” in French, to have all the ingredients measured and prepped beforehand to ensure a smooth maneuver around the kitchen come cooking time. I had the yeast, flour, and all the equipments ready to go and I’m amazed at the amount of time I was able to save! And I’m so in love with the items that I picked up from Surfas Culinary District — plastic dough rising container, bench scaper, yeast, and a can of Vegalene. I can’t wait for the weather to cool down so I can do this more frequently. It’s still way too hot to write a detailed instruction, so … please enjoy these photos! 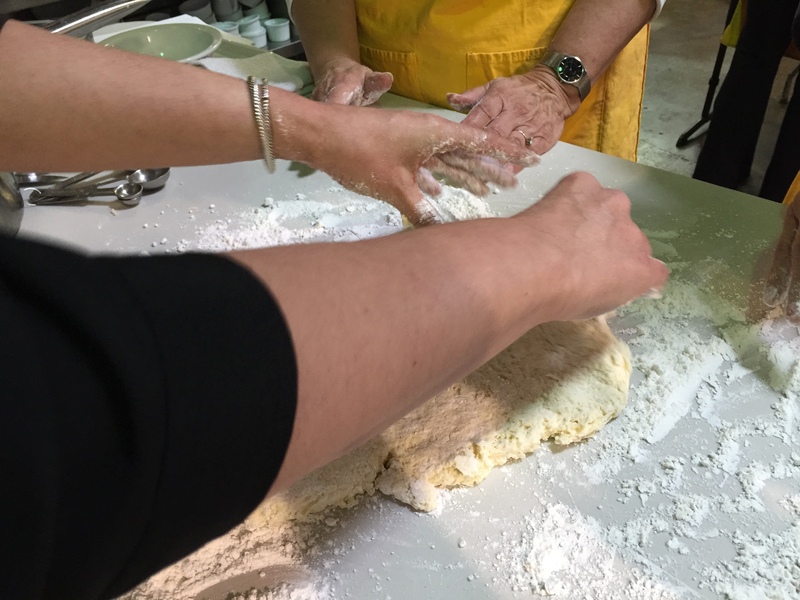 When I was making Ciabatta in the bread-making workshop at Surfas Culinary District in Culver City, I felt a sense of dejavu, like I’ve been here before. It was a new experience but everything somehow felt so familiar. Focaccia has a moist, tender texture and tooth-sinking chewiness. “Ciabatta” — Italian for “slipper,” a reference to the bread’s broad, flattish shape — is subtly tangy with large air pockets and has a pleasantly chewy texture. Oh, now I know why Ciabatta goes so well as a sandwich, while Focaccia makes a lovely accompaniment to soups! Before starting the recipe, you must prepare the sponge, or a pre-fermented dough. Luckily, it was already prepared for us. 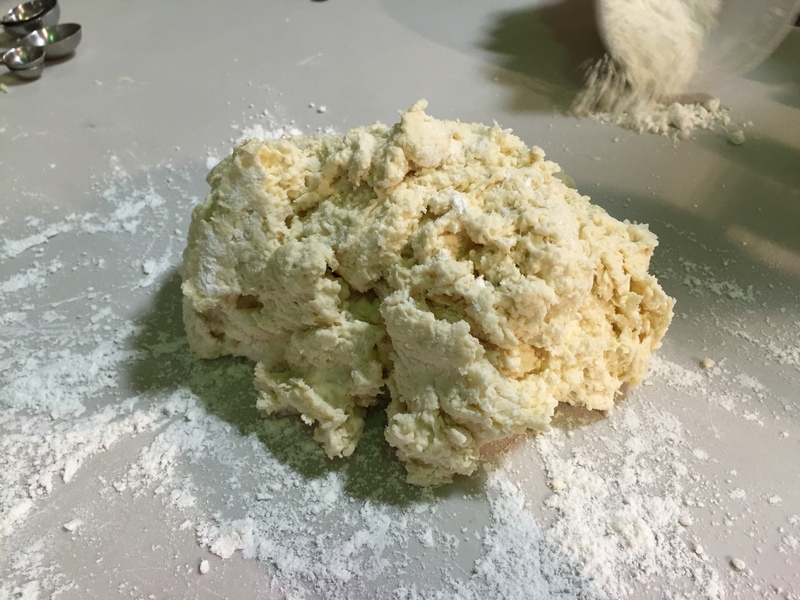 To start, mix the yeast mixture, sponge, water, oil, and flour in a stand mixer fitted with dough hook, at low speed until the flour is just moistened. Continue to beat the dough, this time at medium speed. for 3 minutes. Add salt and beat for 4 more minutes. 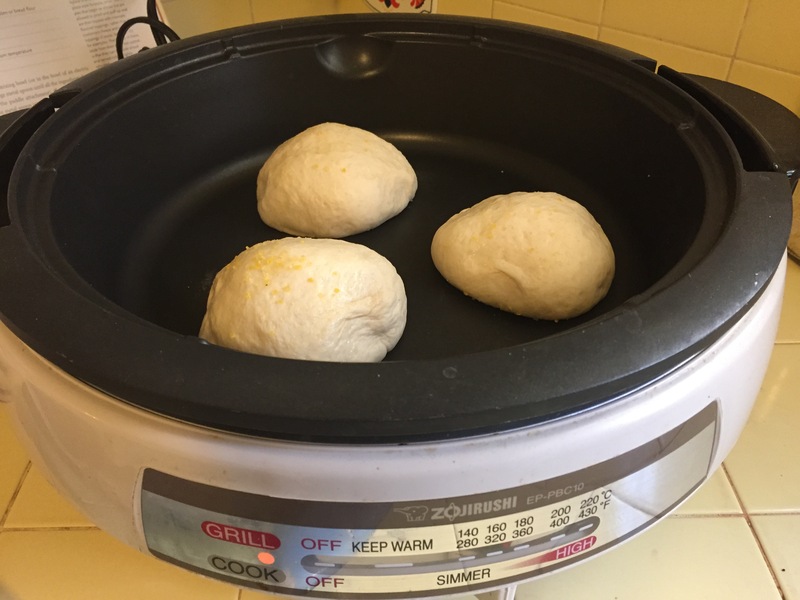 Turn the dough into a large oiled bowl and cover with plastic wrap and let it rise for about 1-1/2 hours, or until the dough doubles in size. Turn dough onto a floured work surface. The dough is very wet and a bit difficult to handle. Cut the dough in half with a bench scraper (an amazing tool) and transfer them onto a baking pan lined with parchment paper. Now the fun part — dimple loaves with your fingers! Let the loaves rest for about 1-1/2 hours or until it doubles in size again. Cover with dampened kitchen towel. Bake for about 20 minutes or until they sound hollow when tapped with fingers. I went shopping (the test kitchen is inside a professional kitchen supply store) while Ciabatta cooled on the rack, which was a bad idea. I wanted everything in the store! I had to hurry up to get out of there before I ended up buying the entire store! 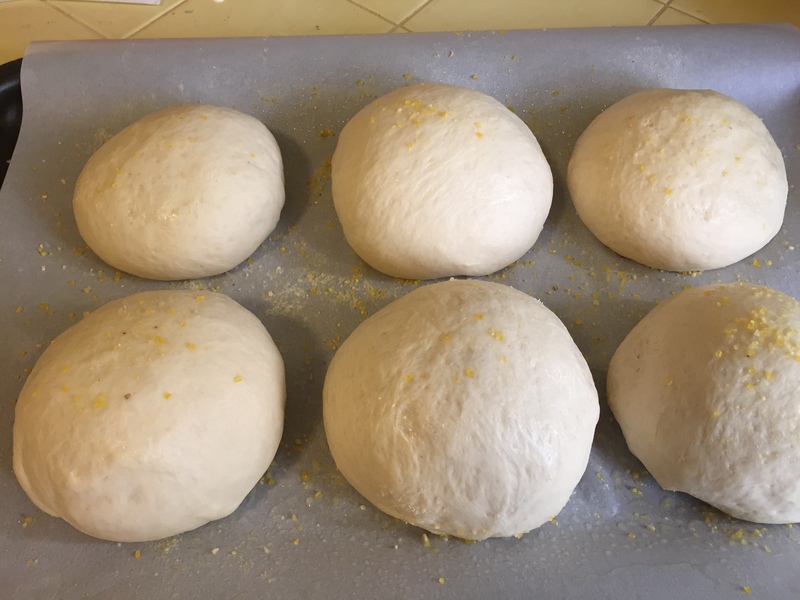 One great takeaway from baking Ciabatta is learning about pizza stone. 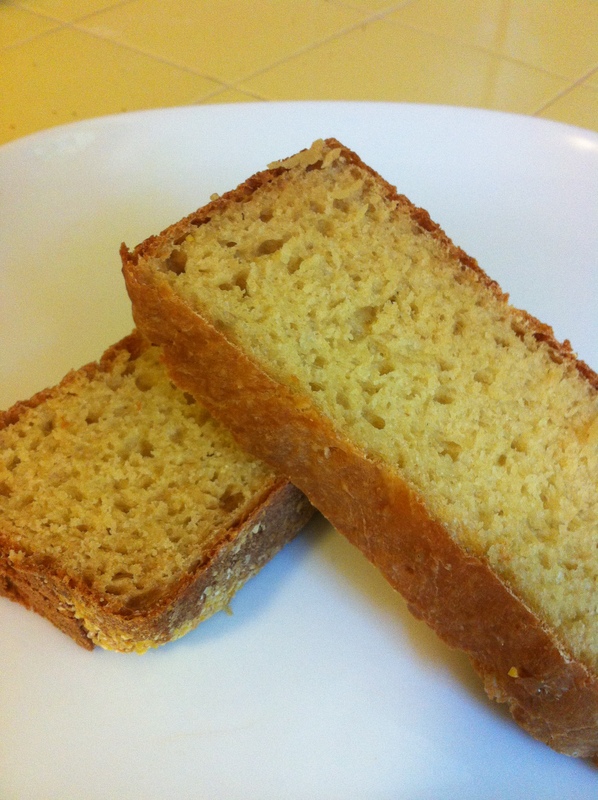 It apparently helps absorb moisture for crispier bread … and crispy and flavorful it was. I ate it when I got home and loved it. I smeared insane amount of mayonnaise on the bread and devoured it. Man, it was delicious! Next up is, last but not least, Brioche! The second quick bread we made during the two-day bread workshop at Surfas Culinary District in Culver City (the first was Irish Soda Bread) was Cream Biscuits, perfect vessels to deliver gravy or honey into your salivating mouth. I don’t eat biscuits much at home but I do love me some of those crumbly goodness drizzled in honey, with an occasional (yes, occasional!) fried chicken from KFC. The best part of it all is that these biscuits come together in a cinch, possibly quicker than trying to figure out how to safely unwrap Pillsbury’s air pressured can without exploding in your face. For the recipe, we used White Lily brand flour. According to the recipe, “The soft bleached gluten in the flour results in light, tender baked products.” If White Lily flour is unavailable, you can substitute it by simply adding 1-1/2 teaspoons of baking powder and ½ teaspoon of salt to each cup of White Lily flour. To start, make a well in the center of the flour ina bowl and slowly pour in the heavy cream. Mix by pulling the flour into the liquid. Stir to form a sticky dough. The texture you’re looking for here is “shaggy” and “wettish.” These adjectives make me chuckle. Turn the “shaggy” and “wettish” (hee hee) dough onto a work surface. … and roll it into a 1/3 to 1/2-inch thick round. Cut the biscuit using your favorite cookie cutter. Make sure to flour the cutter and work swiftly, as the dough is super soft and crumbly. Brush each biscuit with cream. Finally, place the biscuits onto a baking pan lined with parchment paper and bake in a 450 degree F oven for 10-14 minutes or until golden brown. My group partner Heather and I both fell in love with the square cutter with ridges and made our biscuits using it. Big mistake. The biscuits came out thick and doughy, and the finished product wasn’t as cute as we’d envisioned. 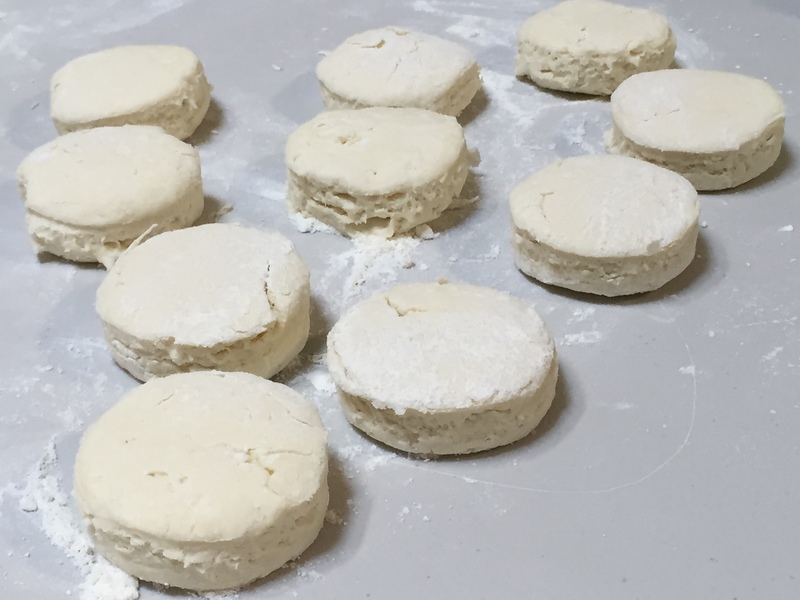 We agreed that our biscuits would have came out crispier and more flavorful using the regular round kind, like the one you see here being used by Chef John. Despite our little hiccup, the biscuits were still very yummy. We smeared the fresh butter and strawberry preserves and devoured them while they were piping hot! Heavenly! All I needed to make these biscuits even more perfect was a bucket (or two) of KFC! If you live in the Los Angeles area and are interested in a bread-making class, I highly recommend Surfas Culinary District in Culver City. I attended the two-day bread-making workshop a few months ago (thanks to my husband who got it for me for Mother’s Day) and had an absolute blast. 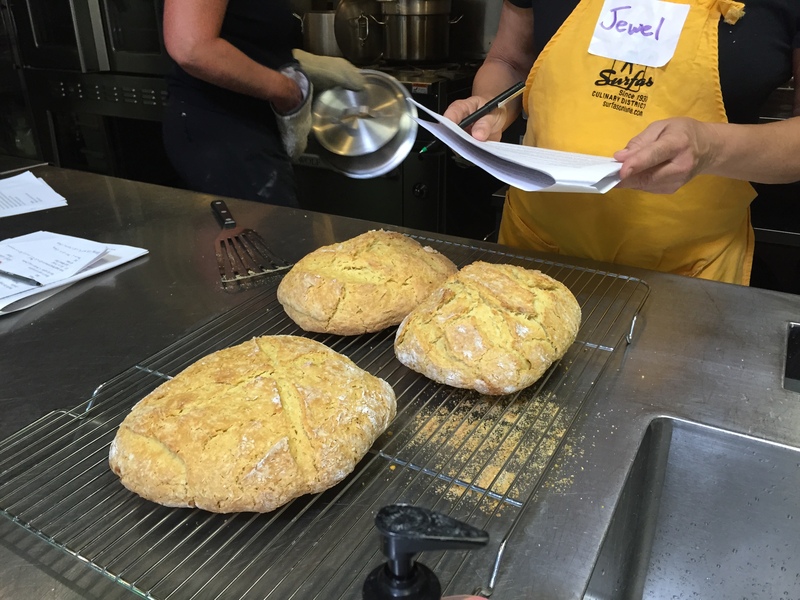 During the two days, the class got to bake five different kinds of bread from scratch, including Irish Soda Bread, Pain de Epi, Brioche, Cream Biscuit, Ciabatta, plus one bonus which was fresh butter. I decided to document the adventures here so I can refer back to them in the future but I won’t be sharing the actual recipes. They are proprietary, mostly created by Chef John Pitblado, who was the instructor for the course. You can get a hold of all the recipes, plus other great information, like The Basics of Bread and Bread Baking Issues, if you attend the class. Speaking of Chef John, I truly appreciated his teaching style. He was knowledgeable and explained the science in a way that we rookies can understand, and he was incredibly patient with answering our questions. He was definitely the main reason why this class was so enjoyable for me. First up: Irish Soda Bread! 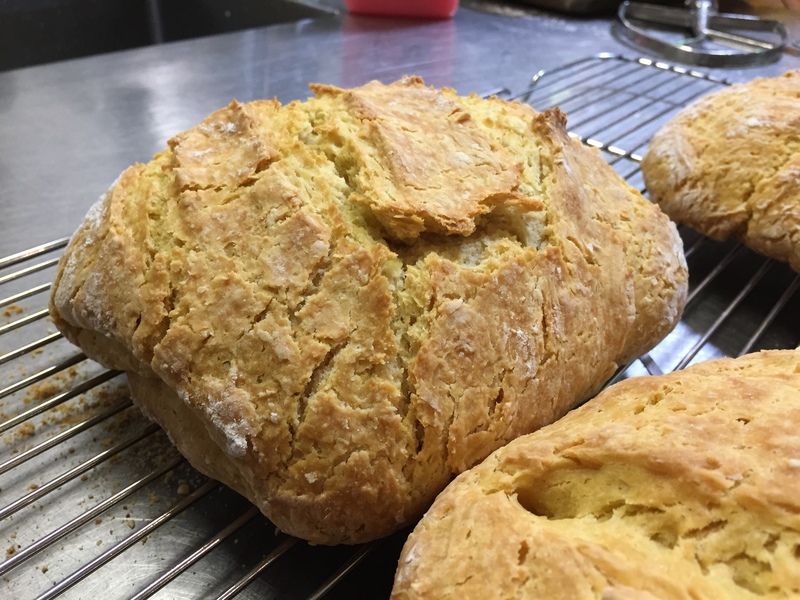 Irish Soda Bread is one of the two quick breads that we baked in class (other one is Cream Biscuit). It uses no yeast, hence “quick,” so it lacks the airy, chewy texture, but its dense, biscotti-like crumble is delicious with jam and / or butter and can be quite addicting. The ingredients are white pastry flour, buttermilk, salt, baking soda, and butter. 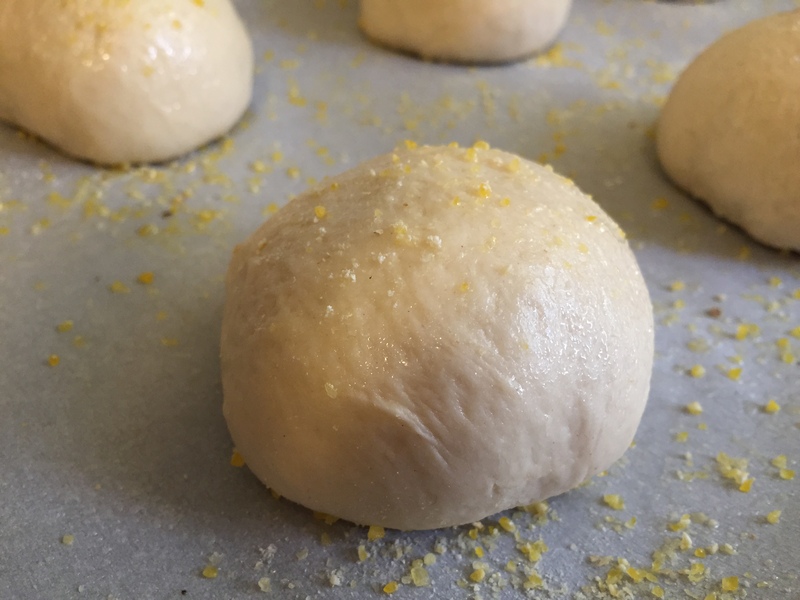 To make the bread, you begin by mixing the ingredients in a bowl (a little elbow grease required) and slowly add buttermilk to form a soft dough. You then turn the dough onto a floured surface and lightly knead to incorporate everything (careful not to over mix). You next shape the dough into a flat round. Place it in a Dutch oven or a pan, and cut across the top of the dough. Cover the Dutch oven or the pan and bake for about 30 minutes in 400 degree F oven. Remove lid and continue to bake for another 15 to 20 minutes. Remove the bread from the pan and cool it on a wire rack. And you’re done! The class sampled the beautiful fruit of our labor while the bread was still nice and warm. Of course, we smeared the freshly-made butter on it. I’m sure you can hear the swoon that echoed in the test kitchen. My new obsession: America’s Test Kitchen from Cook’s Illustrated, on American Public Television’s Create channel. I just can’t get enough of Christopher Kimball and his wicked dry humor. He reminds me of a slightly more cynical version of Alton Brown — both equally scientifically geeky. And I also can’t get enough of the recipes! Every time I watch the show, I get the urge to go into the kitchen and cook up whatever I just saw. And that’s exactly what I did with the English Muffin Bread. It probably wasn’t the wisest thing to heat up the oven to bake this bread when it was over 100 degrees outside, but the result was well worth the sweat. 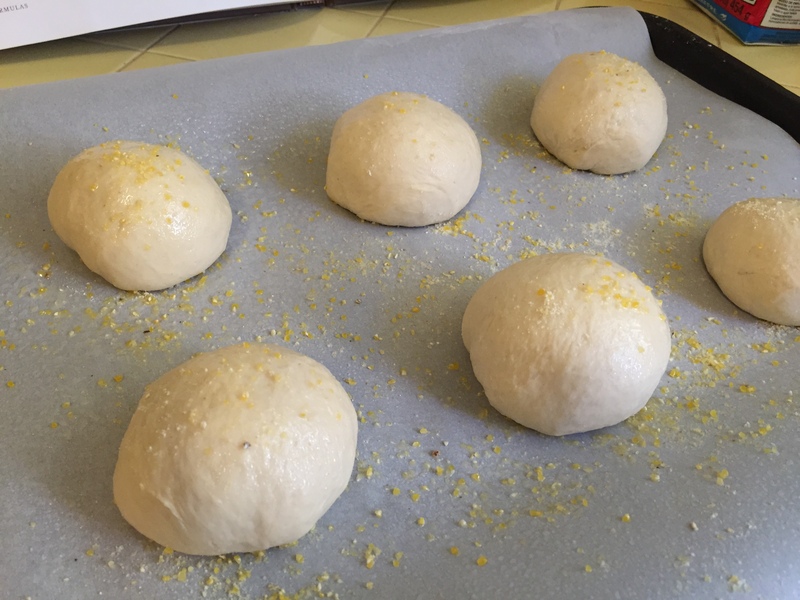 The recipe is super easy and this yeast dough comes around in no time. 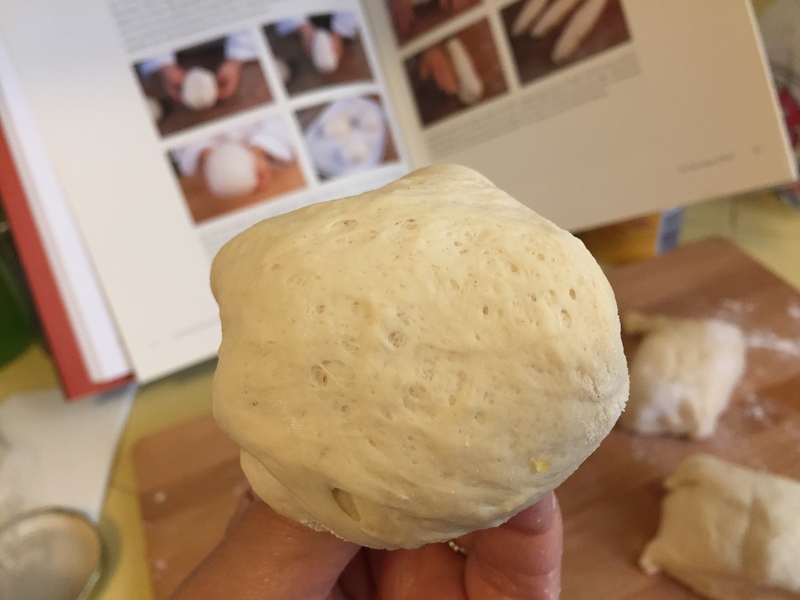 And the best part – there’s NO KNEADING INVOLVED! 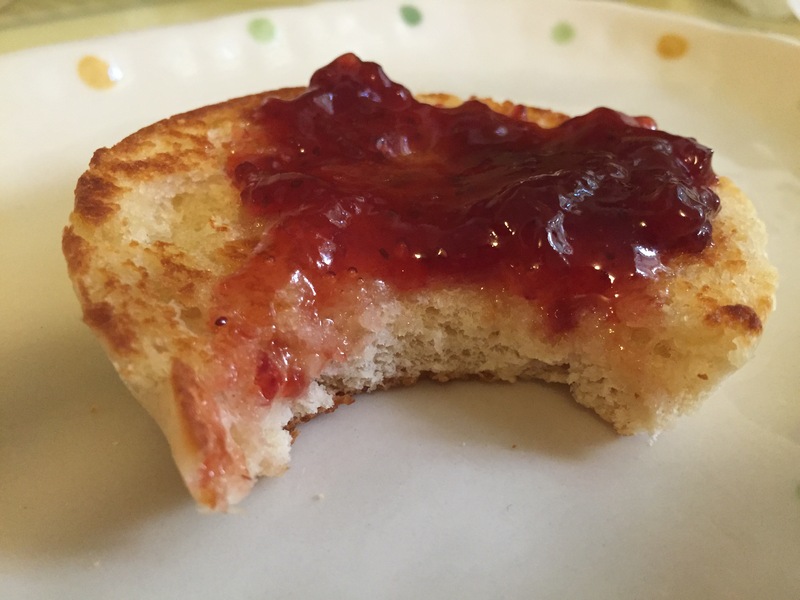 The end result – a perfectly soft and chewy bread, with every nook and cranny waiting for a slather of strawberry jam. 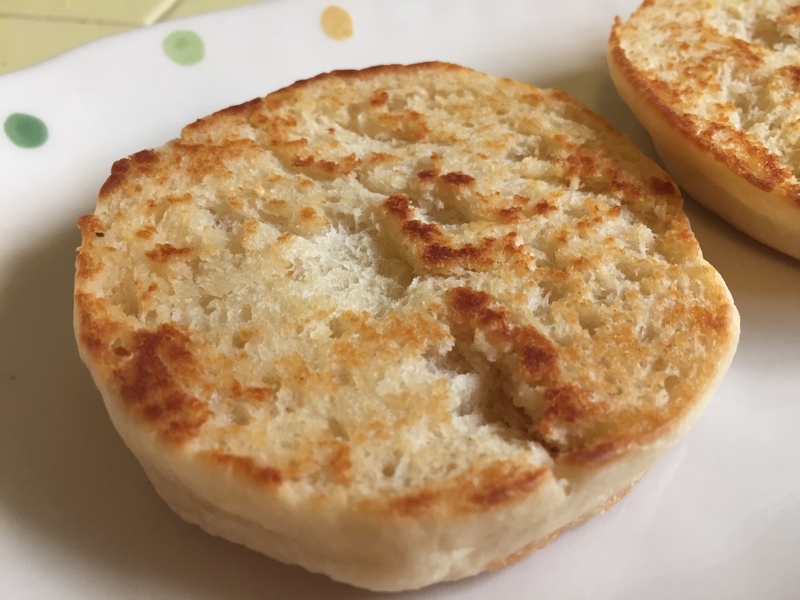 It may not look like the round and thin disk that we might be accustomed to, but it’s English muffin alright. 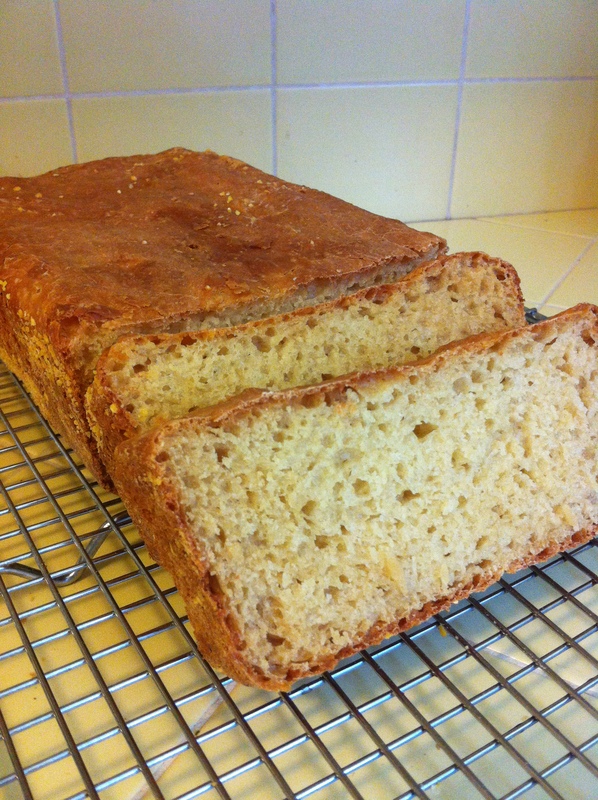 The original recipe made two 8½ by 4½-inch loaf pans but I cut the recipe in half to make just one loaf. What you see below is for one loaf. The instruction was taken directly from the Website. 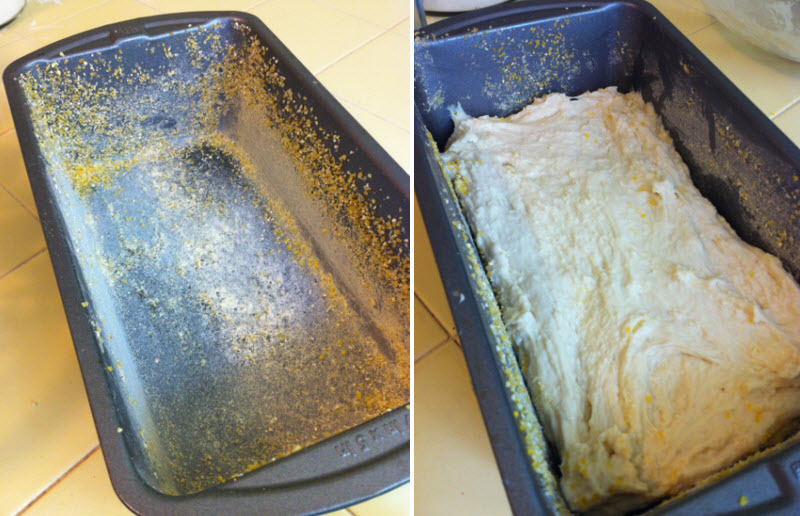 Grease 8½ by 4½-inch loaf pan and dust with cornmeal. Combine flour, yeast, sugar, salt, and baking soda in large bowl. Stir in hot milk until combined, about 1 minute. 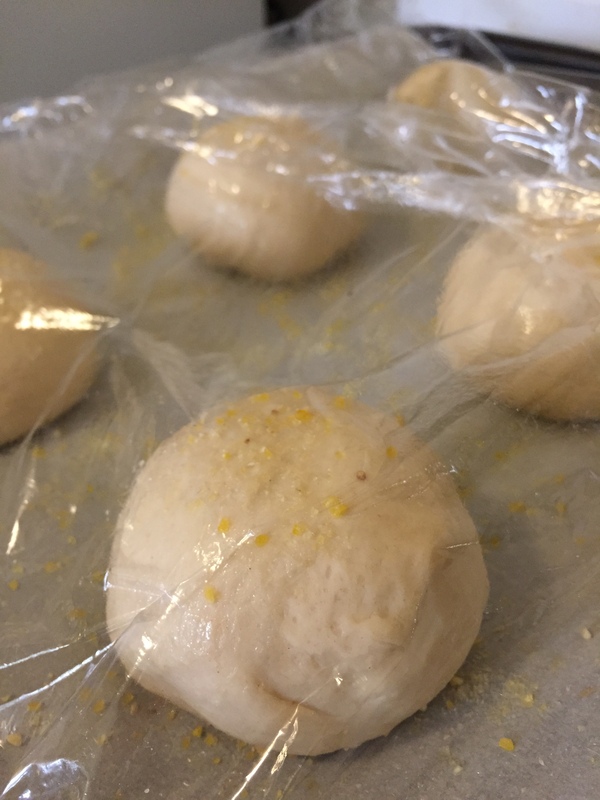 Cover dough with greased plastic wrap and let rise in warm place for 30 minutes, or until dough is bubbly and has doubled. Stir dough and divide between prepared loaf pans, pushing into corners with greased rubber spatula. (Pans should be about two-thirds full.) Cover pans with greased plastic and let dough rise in warm place until it reaches edge of pans, about 30 minutes. Adjust oven rack to middle position and heat oven to 375 degrees. Discard plastic and transfer pans to oven. Bake until bread is well browned and registers 200 degrees, about 30 minutes, rotating and switching pans halfway through baking. Turn bread out onto wire rack and let cool completely, about 1 hour. Slice, toast, and serve. I finally baked My New Roots‘ The Life-Changing Loaf of Bread that I had my eyes on for … well, as long as I can remember. If you Google the bread, you’ll see hundreds of satisfied bakers raving about this nutty loaf. There’s no need for me to go on and on about the goodness of the bread, except to say that I’m now one of them. When I posted a photo of this bread on Facebook, I received two kinds of comments: Half were from health conscious friends who salivated over the loaf full of nuts and seeds, while other half were puzzled. 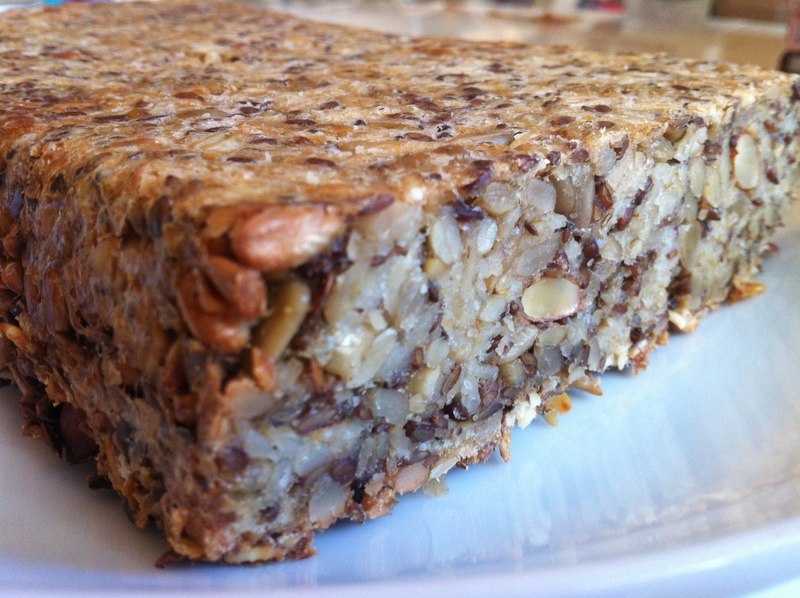 They wondered, is this a bread or just one, giant granola bar? For all the skeptics out there — if you aren’t sure about this bread, just bake one and try it for yourself. You’ll be hopping on the life-changing bandwagon in no time.